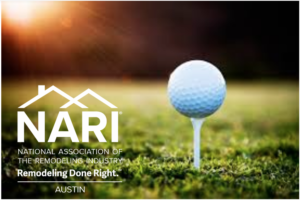 Join Austin NARI on May 16th at Balcones Country Club (8600 Balcones Country Club) for the Austin NARI 2018 Golf Tournament. Our Annual Golf Tournament is a great opportunity for members, guest, and their customers to play a round of golf, visit with sponsors, and enjoy a beautiful day. Registration begins at 12:00 with a hamburger lunch & Fireball Shotgun @ 1:00. Packages includes Dinner @ awards ceremony opened to non-golfers. Social before Dinner starts approx. at 5:30 –Mulligans $30 each limited 3 per player. The Golf Tournament is sold out. But please feel free to use the button below to register for the dinner/May General Membership Meeting. Contact Kayvon Leath to secure a sponsorship opportunity.